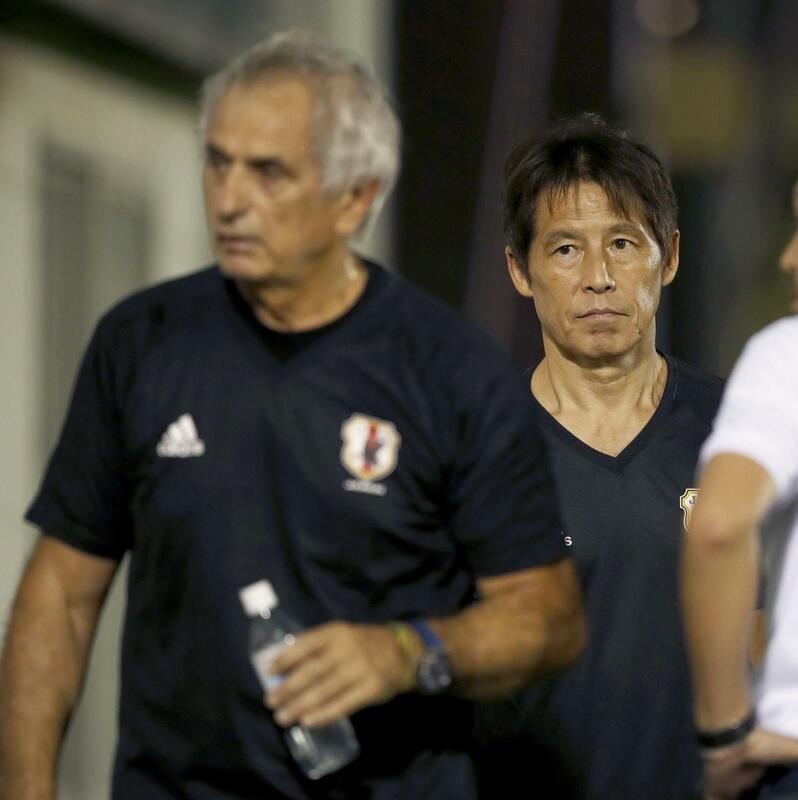 Rumors that Vahid Halilhodzic was on the brink of being fired as Japan manager dogged the Bosnian for almost as long as he was in the job, but it was still a major surprise to see the Japan Football Association push him over the edge this week. Halilhodzic, who led Japan to a place at its sixth consecutive World Cup, was fired two months before the tournament begins and replaced with JFA technical director Akira Nishino on Monday. Changing managers at such a late stage would be considered bold by any national federation’s standards, but for an outfit as averse to upheaval as the JFA, it was a stunning departure. “Even if it only increases the chances of winning at the World Cup by one or two percent, we had to act,” said JFA President Kozo Tashima, who fired Halilhodzic in person at a hotel room in Paris last Saturday, as he faced the media on Monday. If that sounded like an act of desperation with Japan’s chances of making an impact in Russia slipping further away, recent performances under Halilhodzic suggested the JFA had nothing to lose by making the switch. The team was abject in two friendly matches in Belgium last month — drawing 1-1 with Mali and crashing to a 2-1 defeat to Ukraine — with Halilhodzic showing little sign of having a clear plan for this summer’s tournament. The Bosnian continually chopped and changed his lineup throughout his three years in charge, and predicting his final 23-man World Cup squad had become an impossibility. The very real prospect of team stalwarts Keisuke Honda, Shinji Kagawa and Shinji Okazaki all missing out must have sounded alarm bells in the dressing room, however, and it was little surprise to hear Tashima identify a breakdown in “communication and trust” with the players as one reason for his dismissal. It is now up to Nishino to steady the ship before Japan takes on a World Cup first-round group containing Colombia, Senegal and Poland, and at least his knowledge of the team’s inner workings from his time as technical director will stand him in good stead. The 63-year-old also retains much goodwill for leading Japan’s Olympic team to its “Miracle of Miami” victory over Brazil at the 1996 Atlanta Games, and he has a strong track record as the manager with the most wins in J. League history. Underwhelming stints at Vissel Kobe and Nagoya Grampus toward the end of Nishino’s J. League career also live fresh in the memory, however, and it has been over two years since he swapped his manager’s gear for a JFA suit and took himself out of the day-to-day business of running of a team. The JFA’s uncharacteristically late intervention has also raised eyebrows around the world, not least in those countries which Japan will face in Russia two months from now. “From a Polish point of view, it’s strange that Japan fired the coach so close to the World Cup,” Jakub Radomski, a journalist with Poland’s biggest sports daily, Przeglad Sportowy, told Soccer Scene by email. “But on the other hand, we believe they have a reason for doing it and we think that Japan under Nishino will be better because the attitude of the players will improve. Tashima acknowledged the risk in changing managers at such a late stage, and explained that the reason the JFA waited so long to dismiss Halilhodzic was because it was determined to give him its full support. The governing body has come in for severe criticism since Monday’s announcement, however, and can expect an even bumpier ride if its gamble does not pay off. “The Russia World Cup is two months away,” ran an editorial in Tuesday’s Sankei Sports. “That gives the new manager only three weeks to prepare the team, so this is certainly not a positive situation. Tashima says that this is ‘a state of emergency,’ and the team for sure has fallen into a real predicament. Only time will tell if it was the right decision.